Threshold. An invitation to pass through a gateway, perhaps to a new way of life, perhaps to begin a voyage, or from the known to the unknown. For me, this image represents the completion of a yearlong spiritual journey which concludes with this dark moon, and the beginning of another one, commencing with the new moon being born just now in the darkness*. This gateway is known as a torana in China, a torii in Japan, and by other names throughout Asia, where it represents a passage from the prosaic world to the sacred, and is often found before temples. Here it stands before the forest temple, the green world of nature. 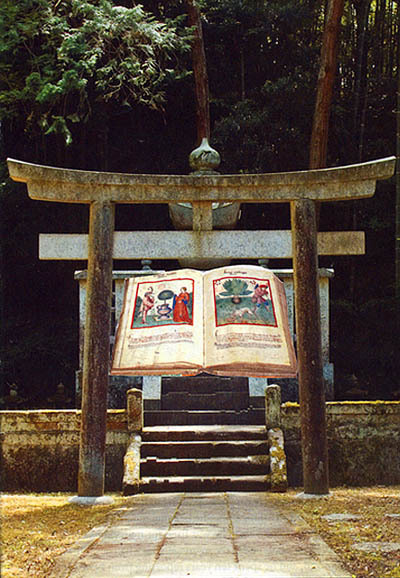 In this image, created during a Soul Collage-type workshop at the beginning of this calendar year, I added the book image within the gate, as a symbol of my path, of following my bliss. The book is a medieval herbal, my favorite kind of archaic book, often full of old wives tales. This book represents not only the medicine path I walked over the last year, but my future creative path. Book as a way to wisdom. Book as reliquary of wisdom. Book my lifelong fascination and friend. And, the green world as my Book. As I write this, a tiny bird visits my own household threshold. She stays quite still for her photo to be taken, and still perches on the door frame. I don’t believe I’ve ever been so close to a wild bird. She seems to be telling me something, if only I could understand her message. She eventually flies away, back to the great world of nature. In the background is my string of bells from Iran, bells being another kind of messenger from Air. This week I begin a journey back east. I too will fly. I will visit one of the places of my childhood, Washington DC. I will journey alone, on a pilgrimage of sorts. My fellow householders will keep the home fires burning for me while I am gone. I will see old and new friends, visit a curator with a box of my handmade books, and spend a week in rural Pennsylvania immersing myself in study, a return to my craft roots and a rare opportunity to learn from an elder in my creative field. I imagine much will be revealed that is not in the plan, as that is the way of journeys. I am open and ready for the quest, curious to find and to see, and excited to be flying the nest, if only for a couple of weeks. I know I am being cryptic, but all will be revealed in time. It is always thus. I hope one of my birder friends can identify this little bird for me? The sudden or unexpected appearance of a bird in celtic wisdom indicates a transformation. If the bird is dead (we had one crash into our front window once), then the transformation is deeply in the underworld. This is my understanding anyway. Birds are often a symbol of transformation, especially if the relationship is profound in some way. I have had other omens and portents lately of transformation. Not in a fearful way. But treading the path mindfully nonetheless. Thank you for the insight. I did wonder if this little one was trying to tell me about the big crows who’ve moved into the neighborhood! 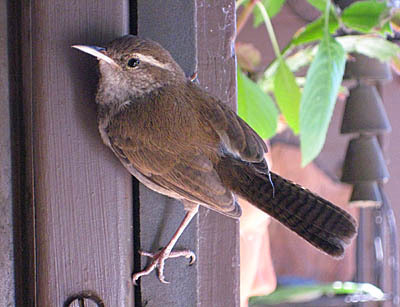 Mystery solved: a Bewick’s wren, could be male or female: dimorphic, says my birder friend – thanks Jennifer!